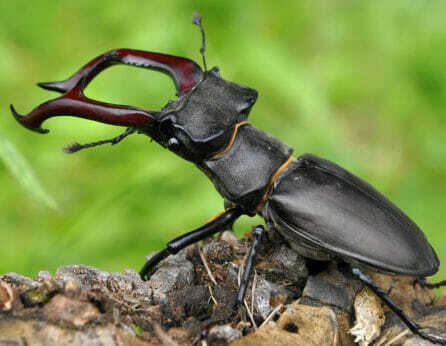 It's simple to turn garden into a home for the incredible stag beetle, which is endangered in some areas. The good news is that humans also have the ability to turn these artificial environments back into something that supports other species. Namely, through gardening. Gardeners are forever obsessing over how to keep critters out, but there are plenty of critters that can be welcomed into the garden without causing havoc. Some actually perform useful services – bats and frogs excel at pest patrol, for example. Study up on the rare and endangered species in your part of the country and choose projects from the following list that will support the threatened birds, mammals, reptiles, amphibians, insects and plants in the ecosystem where you live. What could be easier? Designate an out-of-the-way corner of the yard as a place to pile up leaves and cut branches, which serve as habitat for many reptiles, mammals, birds, and insects. 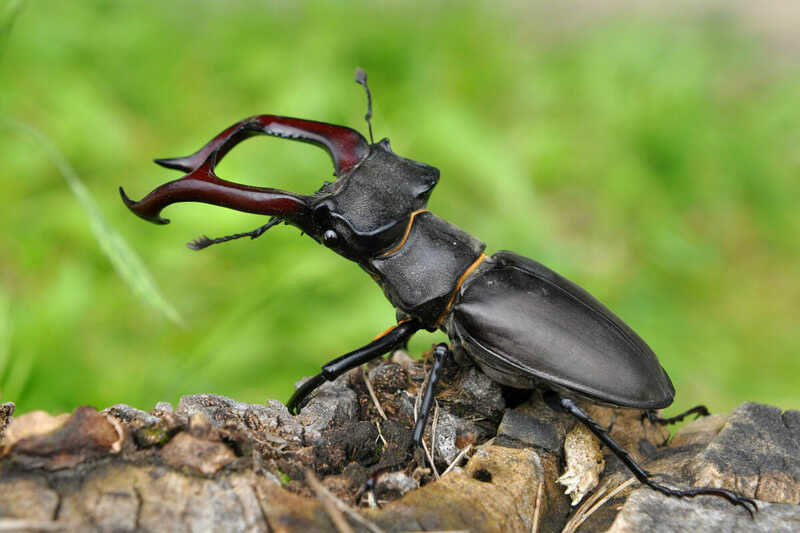 Perhaps you’ll even attract the noble stag beetle, an enormous insect with fierce-looking (but harmless) pincers, which requires rotting wood to reproduce (and is endangered in some regions). Add to the top of the pile as often as you like, but otherwise, leave it in place and let it rot. Both of these beautiful beings are extremely sensitive to habitat loss but easy to attract to the garden. Hummingbirds have coevolved with tubular-shaped flowers, like honeysuckle and salvia, for which their beaks are perfectly adapted to siphon nectar from; they are especially attracted to red and orange blossoms. Butterflies gravitate to large nectar-rich flower clusters, like those found on yarrow or milkweed (a favorite of monarchs), though many other plants, like such as rue and maypop, serve as host species for the larva of particular butterfly species. Check which species of hummingbirds and butterflies are rare, threatened or endangered in your area and concentrate on the plants that are most attractive to each. 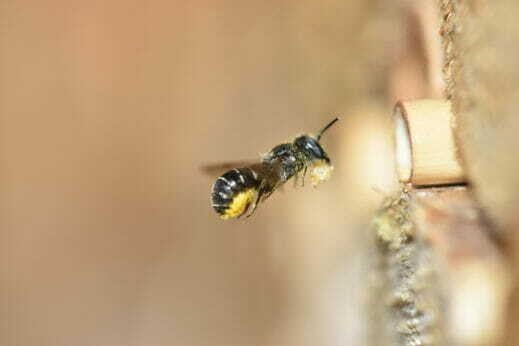 You don’t have to be a master carpenter to hammer together a piece of bat, bird, or bee habitat – and there is good reason to do so: Bats and many birds eat pesky insects by the thousand and native bees (which, unlike honey bees, do not sting) are critical pollinators for native plants. You can even build a house for owls, which are masterful hunters of rodents. If the conservation of threatened species is your goal, be sure to find a design suitable for the winged ones that you wish to offer refuge. Many gardeners dream of having a fancy (and expensive) water feature, but to satisfy the needs of wildlife you need little more than an overgrown mud puddle. Simply dig a broad, shallow depression – six feet wide and one foot deep in the middle, with gently sloping sides, will do – and line it with a piece of polypropylene pond liner from your local garden center. Add sand, pebbles, gravel, and rocks of varying sizes, including a small boulder that sticks above the waterline, and place a log or two so that they overhang the edge of the pond. Buy a few potted reeds, sedges and any other aquatic species that you wish, nestling the pots down into the gravel – the plants will soon colonize much of the open water. If any amphibians in the area are in need of a home, they will follow their nose to your water garden. You may soon find lizards suntanning on the log and turtles on the boulder. Dragonflies and other beneficial bugs will be zipping about the pond surface. If you succeed in attracting amphibians, they should keep mosquito larva in check, but if needed, you can contact your local agricultural extension office and request “mosquito fish” – little minnows that will take care of the problem. It’s not just animals that lose their habitat as we pave over nature’s paradise. Native plant species are also disappearing at an alarming rate. And by introducing native plants to your garden, you’re creating the very definition of wildlife habitat, as all native animals have coevolved with, and are dependent on, certain plant species. Garden centers around the country increasingly stock plants that are indigenous to the local landscape, and nurseries that offer exclusively native plants are springing up all the time. You might also try contacting your nearest native plant society, as these groups often host seasonal plant sales. Native plants often have smaller flowers and less showy foliage than nursery specimens that have been bred to maximize aesthetic traits. The individual attractiveness of natives may be understated, but their beauty comes out when grouped – drifts of wildflowers interspersed with puffy grasses and punctuated by the occasional tree or shrub, for example. Plant them as a border around your garden, aiming for a naturalized look. You’ll soon find a menagerie of critters taking up residence, as nature intended. WE can’t make a real difference until the farmers stop using EXcessive amounts of pesticides ( herbicides, insecticides) on the plants and soil.